"In a relationship, you're a team, you're supposed to communicate, you're supposed to work things out together," said Rafael Rosell about the things he learned from his recent breakup with long-time girlfriend Malaya Lewandowski. Three weeks ago, Rafael Rosell got teary-eyed as he confirmed his breakup with his girlfriend of three years, Malaya Lewandowski. At the press conference of his latest movie Status: Single last January 20, Rafael said that he was shocked by his former girlfriend's decision to end their long relationship. He said, "May mga bagay na kaming hindi na pagkakasunduan. But I'm ready to make sacrifices. Hindi ko na lang pinapansin ang mga 'yon because alam ko na we are in love and I thought that was enough for us. Hindi naman pala." More than a week after, PEP (Philippine Entertainment Portal) received an email from a PEPster, who was asking for a story about the status messages of the Coverboys member in the social networking site Facebook. PEP tried to contact Rafael's handler to confirm these status messages. After several attempts, however, we were left hanging—without any statement from Rafael or Star Magic, ABS-CBN's talent arm which handles his and Malaya's showbiz career. Fortunately, last February 10, Candice Lim of YES! magazine had a photo shoot with the 26-year-old actor. She was able to ask for a confirmation about the said email and Rafael was kind enough to openly talk about what happened to his most recent romantic relationship. THE KINDNESS OF STRANGERS. Before he explained each status message, Rafael first explained why he opened up about his feelings on Facebook. "We're together kasi for three years," he began. "For those three years, ever since I came to the Philippines, I haven't found a friend that I could actually open up to and say lower my pride, put down the walls, and just cry to, ask for help or moral support. "I did this because I know she has a brother that she could go to, she has the whole family support. I don't like involving my families, especially my mom, sa mga problema ko sa buhay. I don't wanna trouble her with things, the consequences that I make. So, what I did, I posted things just to see who was on my side, because I felt I don't have, didn't have anyone on my side. "I felt like she just dropped everything and I was left there with nothing. So, I also realized na since she was my worth for three years, I lost connections with a lot of my friends. I didn't know who to reach out to so I did that and people come, and I finally realized na I have a lot people who support me and believe in me." After letting it all out on his Facebook account, Rafael was surprised that a lot of people expressed concerned for him. "It's a great feeling to know that, you know, people you don't even know will still be there for you. They say na it's easy to open up to a stranger. Sometimes it helps, just open up to a stranger coz he doesn't know anything. When I did that, people actually listen and they gave me support." "THIRD PARTY, NO. LEFT ME FOR ANOTHER GUY, YES." Before he could explain the first status message, Rafael already clarified that there was no third party involved. He said, "Third party, no. Left me for another guy, yes." Then he continued with the first status message: "Rafael: Just found out... there was a third party. 5:41 am." "I was angry, I jumped to conclusions fast," he explained, "that's why I should change that actually. I jumped to conclusion fast because I have this need to have an answer for things that are happening. I jumped to conclusion fast, it was bad." Second status message read: "Rafael: **** him and his preaches. He destroyed the only treasure I possessed. 5:43 am." After reading it aloud, Rafael went on explaining about the guy who was possibly the reason of their breakup. He said, "There's this guy kasi, I'm not gonna say who, it's not the first time he did this. He's done this to other friends of mine. He approaches a pretty girl, preaches about God, and says a lot of stuff na parang, 'Jesus...' or whatever. To the point where the girl starts questioning her own faith na. And he offers a helping hand to help her out." Rafael said that he understands that there's nothing wrong with giving lectures about God. But it should be done with good intentions. "Para sa akin, there's nothing wrong with that," Rafael stated. "Go ahead, preach about God and do whatever you like. Pero if she's in a relationship, why didn't you include me in the search for God if you didn't have intentions with my girlfriend? So, he preached to her or whatever he did and, like what I said, 'He destroyed the only treasure I possessed.' I really valued our relationship, I really valued my girlfriend." The next status message that Rafael explained was: "Rafael: After all I did for you... 6:19 a.m."
Rafael did not only mean material things that he shared with his former girlfriend. "Everything, I did for her," he said. "I even gave her lessons that I learned throughout life, stuff like that. Basically, that was the bitter one, 'After all, I did for you.'" The fourth status message made Rafael talk about the trust in a relationship. It read: "Rafael: If your partner chats with a person every night for a month, and you think it's harmless... Think again... 7:37 am." "I trusted her kasi, e," explained Rafael. "I mean, she was like chatting, okay, it's just fine, chatting naman, e. But little did I know, she was chatting every night. I knew it, but I thought it was just about God or she just found a friend. Then, little did I know, she was actually gonna leave me because of what he said. And she realizes stuff to make her leave and drop everything like a diamond, just leave. So, 'If your partner chats with a person every night for a month, and you think it's harmless... Think again...'"
On the fifth status message: "Rafael 'One cannot change the past, just learn how to do better in the future'... 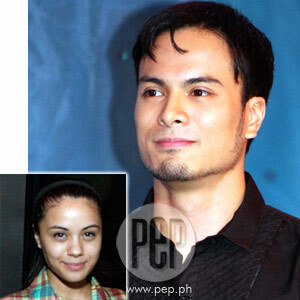 I forgive you...4:31 pm," the Filipino-Norwegian actor stated that he learned to forgive his former girlfriend. Although he initially thought of revenge, Rafael just couldn't do it especially when he read about forgiveness on the Bible. Rafael recalled, "I wrote that dahil I read up on the Bible and that's what you can do talaga, just forgive, e. I was at the stage where I really want to make revenge talaga. But I decided na... revenge is easy, forgiveness is difficult. It's the most difficult thing you can do when you get hurt. So, there's nothing I can do with the past, 'Sana ganyan, sana ganyan...' It already happened, e."
He became so open in sharing his thoughts that he was able to crack a joke: "So, next time, I'll try not to do that again. Maybe I shouldn't have an Internet connection...I'm just kidding." For his last status message, Rafael tried to remember if he really wrote it on Facebook. He was clueless that he even said, "I don't even know I wrote this." After some thinking, Rafael admitted, I wrote this: "Yup. Looks and personality can be deceiving.' Yeah, this was out of bitterness din." He continued, "I mean, she looked like an angel, she acted like an angel, then she dropped me like a devil. 'I don't even know who the guy is,' because I used to see him everyday sa gym and he looks innocent. Pero using the word of God for wrong intentions, I think that's wrong." GETTING BACK ON HIS FEET. Rafael admitted that this breakup made him depressed and it took him a while before he started to move on. "I didn't know what to do," he said. "It was fine the night before. Everything was fine, then, all of a sudden she comes out with all these things that she wanted to talk with me about that she didn't talk to me about. I mean, in a relationship, you're a team, you're supposed to communicate, you're supposed to work things out together. But she outsourced and started talking to this other guy, so para sa akin, it's not fair play." So, what was the first thing he did to move forward? Before writing down his thoughts on Facebook, Rafael turned to his mother. He related, "First thing I do, I talked to my mom. That's the first time I actually talked to her. It was the longest time, actually, na parang I was down." He also added that his mother gave him the best advice he could get during the lowest point of his life. "I talked to my mom about it and she gave me the best solution talaga. Sabi ko sa kanya, 'Mom, sobrang depressed ako.' Then, sabi niya, 'Ganyan naman talaga ang buhay, e, it's not fair. But in the end, ano ba talaga ang magagawa ng pagmumukmok mo diyan sa bahay?' That's when I realized, 'Oo nga, ano?'" With this realization, Rafael started to go on with his life. "I decided to just stand up, get back on my feet, and not be bothered too much about it. In the end, I can honestly say that I stepped out of this relationship and moved forward and say that I did everything that I was supposed to do, even more."